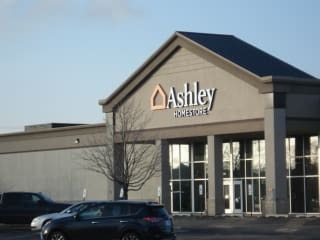 Here at the Ashley HomeStore in Joliet, Illinois we believe that your house is much more than just a dwelling. You’re creating a home filled with family and friends, and building life-long memories along the way! This is what inspires us to help you furnish and decorate your home with our helpful veteran sales associates and a high level of customer service. We have been your go-to furniture and mattress store in Joliet since 2010. Our dedicated and experienced sales team is committed to being your trusted home partner and they pride themselves on their selection and knowledge of bedding and living room sets. At the Joliet, IL Ashley Furniture Homestore we are not only thankful to celebrate your home with you, but we are also dedicated to charitable work with the Hope to Dream Foundation. You can find us across from the Joliet Mall. We look forward to being the furniture store that helps you fill your home with memories, and hope to see you soon! Waited 45 minutes for someone to help us place our order for a sectional. Two days later, their own website is showing a lower price for the couch, so I called them to see if they do price corrections. They said they can match the sale price for the couch, but when I asked them if they can also match the 10% off sale from the official Ashley website, they said they would call me back. They never called me back. Gary was very knowledgeable and thorough when preparing our orders. He spent time answering our questions and doing all he could to get the best price for is. It took a while to break our order up for different delivery dates, but we are pleased. My eye caught a bedroom suite as we were leaving so I may be back very soon. Good experience. Thanks Gary! Nila my sales rep very helpful. Will return to purchase again. Hope Nila is still there. Nice selection of furniture. My only issue was I was in the store basically by myself and never had anyone offer assistance or ask me if I had questions. I was surprised as I had such a great experience at the Ashley Outlet. Very pleased with our purchase today. Our sales person Nila was knowledgeable and helpfull and we will definitely come back to work with her again. Beautiful furniture. We bought a bed and a couch. We went back for dining room chairs. We are enjoying all of it. Nice atmosphere The furniture was displayed nicely! Rachel went over and beyond to our satisfaction . Would recommend Ashley furniture store to others and will return. I went into ashley furniture looking for a very specific mattress. I was greeted by a salesman named Gary he took me back to the mattresses when I asked about the one I had in mind he advised me they did not have those at that store. He was very polite and never tried to push me on something I didn’t want. Although I was not Able to make a sale with Gary I very much appreciated his time and patience! If you’re in the market for furniture please see Gary great guy! Adam at this store is great and made several purchases with him. Adam always took care of me and always gave great customer service.